EcoSelect is Fusion's built-in programming designed to make the Fusion save energy and use fuel smartly. At the press of the EcoSelect button, the Fusion automatically adjusts its use of heating, cooling, acceleration and deceleration to optimize fuel economy and battery recharging. The addition of EcoCruise technology enables the Fusion to automatically decelerate slightly when going up hills for maximum economy. Enjoy Wi-Fi with 4G LTE speeds powered by AT&T. 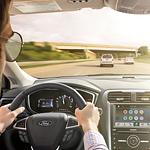 FordPass Connect creates an in-cabin wireless network that supports up to 10 devices within a 50-foot radius. See why the Ford Fusion is everybody's favorite mid-size sedan. Stop by Lasco Ford today for a test drive.